Choosing the correct pair of gloves is critical to enjoying a comfortable ride. They help in absorbing sweat and in eliminating road vibration. When chosen right they will fit you right, provide great comfort and look aesthetically appealing. Read through to understand the parameters we consider while choosing the right pair of gloves. Choose a pair that feels comfortable i.e. sufficient mobility in your palm, not feel heavy and which gives a snug fit. Majority of the gloves are made up of synthetic leather on the palms and spandex on the top. It is important for the material to be breathable and flexible allowing for sweat absorption and easy mobility, respectively. If you are riding in the rainy conditions you should opt for waterproof gloves. Padding is another important thing to consider. It helps in absorbing road vibration which enhances your ride comfort on long rides. Generally, padding is of two types: foam and gel. Foam allows better connect to the bike’s handlebar because of minimal padding. Gel, on the other hand, is heavily padded, providing greater protection from intense surface vibration. 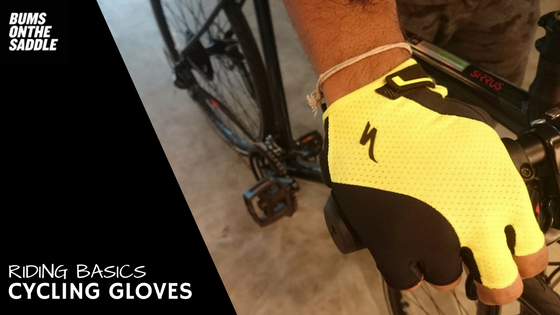 Choose a form glove if you riding on road & gel gloves if you are riding the trails. There you go. Owning a pair of cycling gloves are essential. We are confident that by following the above tips you will walk halfway onto getting the right pair of gloves. 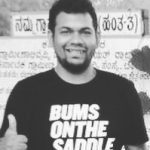 Wish you happy cycling!